Is Organic Meat Worth It? She has a point. If it doesn’t taste good, the discussion ends there. However, organic meat does taste good, very good. So if that’s all you need to know, consider the issue resolved. If you still aren’t sure why you’d want to pay more to get the good stuff, you may want to know a bit more about what you’re actually eating when you sit down to that nice, juicy steak. As I’ve become more aware of what’s involved in meat production, I’ve also become much more keen to source organic, grass fed beef for the occasions I choose to eat it. On the organic side of the equation it boils down to this: the last thing I want entering my body is genetically modified corn, pesticides (sprayed on the corn), hormones and antibiotics, passed down to me in the form of beef. Cows in the industrialized meat industry are fed GMO corn. Corn is a grain, which cow stomachs are not designed to digest. Cows are ruminants, they chew their cud. In the industrialized food process, cows are kept closely packed together and cannot lie down to chew their cud. Cows are kept in such close quarters and in such great numbers that disease is easily spread, hence the heavy dosing of antibiotics. The only priority in commercial farming is profit, so cows need to fatten up quick. That’s where the growth hormones come into play. Cutting out the carcinogenic chemicals and going organic was a no-brainer, especially when I learned that all the nasty stuff collects in the fat of the animal. Fat is also what gives food its flavour so if you want tasty meat, you are eating fat. Then there’s the “grass fed” part of the equation. Why not choose beef that’s organic and be done with it? Or choose “naturally raised” beef? Well, if you’ve never seen how mass-produced cattle are raised, just wonder for a moment why it’s called “factory farming.” Really, it’s just like that. No pastoral scene of mother and calf, this. Grass fed cows eat grass. Not grain and not other cows. That’s more healthy. 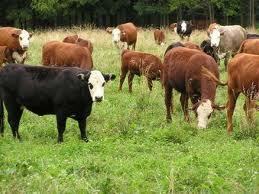 Grass fed means a cow has had access to grass. In a field. At liberty. With other cows, doing what cows do. Cows need to chew their cud to digest their food. It’s what nature intended. In a field, there’s room for a little ruminating. Stockyards used to be where cowboys drove their cattle after life on the open range. Now, they may live almost their entire short life there. To me, that is inhumane. Cows are animals, not machines. The research is very clear — they have feelings, they need to socialize, they develop bonds. Providing them an opportunity to live without undo stress seems the least we can do. If you are still one of the few who believe the treatment of animals is no big deal, you can hold to that opinion and still recognize the value of grass fed beef. When I thought that way, I still couldn’t believe there was much nutritional value in a cow eating food it was never meant to eat, in an unnatural environment. Don’t take my word for it that. You need to know enough to decide what matters to you. Just don’t stay in the dark about where your food really comes from. This entry was posted in General, Industry Issues and tagged Ecoholic book, Food Inc. movie, FRESH documentary, GMO, grass fed beef, growth hormones, industrialized food, John Robbins, King Corn movie, Michael Pollan, Organic, Our Daily Bread movie, The Food Revolution book, The Omnivore's Dilemma on November 2, 2010 by local delicious. Claims to prohibit antibiotics (but allows ionophores used as coccidiostats for parasite control). While those are important practices, Consumers Union believes only specific product claims should be allowed, such as ‘no antibiotics or hormones ever administered’. They should not be couched under a vague and misleading term that does not address how the animals were raised, their main diet, treatment of animals, space requirements, and other concerns. This entry was posted in Definitions and tagged Ecoholic book, GreenerChoices.org, USDA on February 11, 2010 by local delicious. “The definition of Grass Fed Beef generally means beef from cattle that have eaten only grass or forage throughout their lives, however some producers do call their beef grass fed but then actually finish the animals on grain for the last 90 to 160 days before slaughter. This entry was posted in Definitions and tagged Ecoholic book, grass-fed-beef-101.com, USDA on February 4, 2010 by local delicious. “No hormones are used in the raising of chickens. This entry was posted in Definitions and tagged Ecoholic book, USDA on January 28, 2010 by local delicious. This entry was posted in Definitions and tagged Ecoholic book on January 21, 2010 by local delicious. Yes, I too have spent significant time reading the packaging at the supermarket. Which is better? Free-Run? Free-Range? They aren’t the same? Read on for more. Check out the definition for Free-Range Chickens as well. Please note: Free-run chickens can also be called “cage-free chickens”. “Free-Run hens are raised free from battery cages and are kept entirely indoors on a barn floor. Free-Run housing that provides deep bedded sawdust (or other fibrous bedding material) is often referred to as a Deep-Litter System. 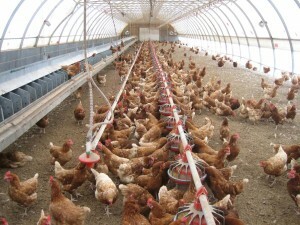 Free-run housing does not necessarily provide more space per hen than conventional battery cages, and is not required to provide resources such as nest boxes, perches, or a substrate for dust-bathing. While free run hens have no access to the outdoors, the barns may be designed to allow natural light to enter and the birds are better protected from external threats, such as predators. This entry was posted in Definitions and tagged Ecoholic book on January 14, 2010 by local delicious. “Biodynamic agriculture is a unique form of organic agriculture. It seeks to actively work with the health-giving forces of nature, recognizing the spirit as well as the physical. Biodynamic practitioners work to balance the life-forces and heal the earth, while producing food that is truly nourishing. This entry was posted in Definitions and tagged Ecoholic book, Society for Biodynamic Farming and Gardening in Ontario on January 7, 2010 by local delicious. I suspect this is much closer to the images of happy chickens we assume to be chicken-farming reality. Read on and check out the definition for free-run chicken as well. This entry was posted in Definitions and tagged Ecoholic book on December 31, 2009 by local delicious. Fair Trade has been around for a while now, especially in connection with coffee and chocolate. The fair-trade logo is the same for both Canada and the US. Fair Trade is a trading partnership, based on dialogue, transparency and respect, that seeks greater equity in international trade. It contributes to sustainable development by offering better trading conditions to, and securing the rights of, marginalized producers and workers – especially in the South. Fair Trade Organizations, backed by consumers, are engaged actively in supporting producers, awareness raising and in campaigning for changes in the rules and practice of conventional international trade. This entry was posted in Definitions and tagged Ecoholic book, Fair Trade Certified, Fairtrade Labelling Organizations International, Network of European Worldshops on December 17, 2009 by local delicious.